I write this as a huge pile of dishes awaits my hands and as my son sits in a bath hopefully relaxing and calming down. It’s 10.30 in the morning and the day has not started too well. JJ had a late night last night – about 10pm which is two hours after he’s normally asleep and we’re both suffering for it today. I asked him to pack up something and he couldn’t find it and just completely lost it. I didn’t have the inclination to lose it myself so as I do in these situations I laughed, trying to get him to see the funny side. He was too tired and too overwraught to see any funny side so he just screamed at me more. This is why I ran his bath and he’s now happily playing in it. I even put some lavender essential oil in which is supposed to calm and relax. 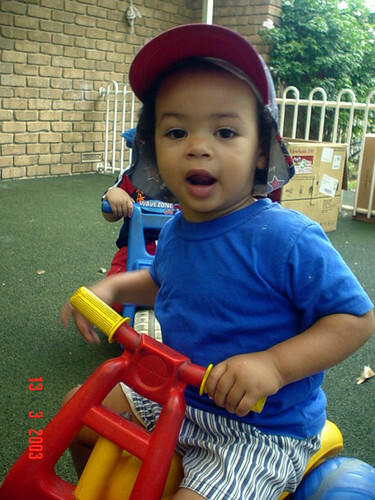 I found some photos that his first childcare took which remind me of how cute he was back then (he’s still very cute now of course). These photos remind me of the time that he first started having those terrible two type tantrums. I remember leaving childcare one evening after picking him up and he wouldn’t walk out to the car. He wanted me to carry him. Ever since he could walk I’ve made him walk because he’s always been too big and heavy for me to carry. 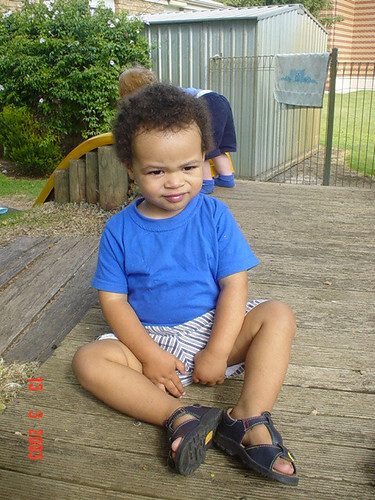 This night he refused to walk so we sat out the front of childcare for a while until one of his carers came along and convinced him to walk. Neither of us were going to give in. He’s come a long way since then and there is a very polite boy that I get to witness sometimes, but sometimes that two year old is still there also. 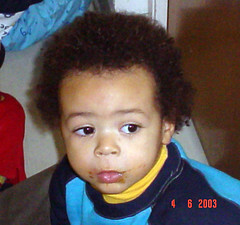 Oh wasn’t he a cutie (yes, yes, grit your teeth and remember the tantrums, but he was very cute!). Its just a pain in the proverbial when you do something “fun” like stay up late and it melts down the next day. I am so glad he is having a good time in the bath – may be a DVD afternoon? Found your site from dooce’s – just stopped by to say hi! We are so there at the moment. As I type this, I am listening to Noah screech at his big sister outside because she is nort performing to his liking. *SIGH* It’s been a while since I have had to deal with the terrible two’s. What a little sweetie ! Mother Nature is kind in that your memory of the tantrums will fade…and ,if you’re like me, you’ll suddenly wonder where all those grey hairs came from lol. Ohhhhh, he’s so cute Jen. Now he’s still so cute…but a grown-up boy cute. Kisses and hugs to you both….